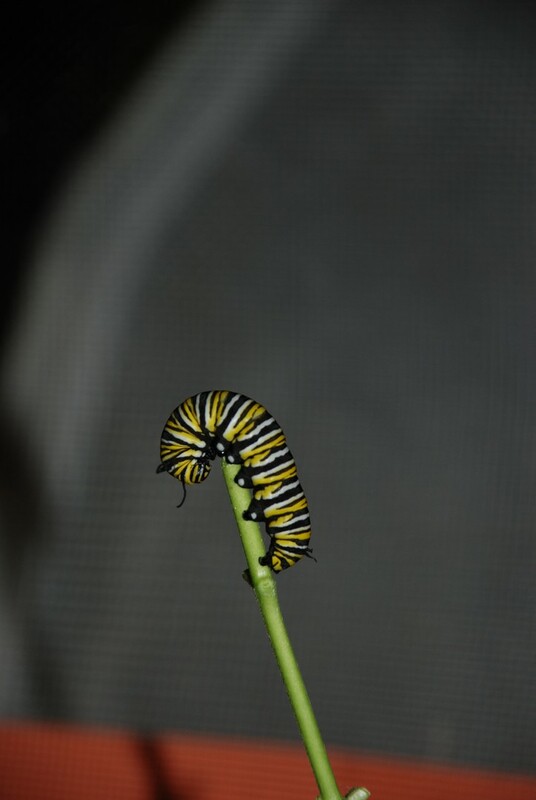 Come to Hidden Oaks to watch the amazing growth of recently hatched monarch caterpillars. The caterpillars are approximately 3-5 days old and range in size from .25 to .50 inches. They are feasting on native common milkweed leaves and are on public display at the front desk. As they mature they will be in a six foot tent in the classroom. We are too early in summer for monarchs to be developing from eggs laid on our milkweeds. These caterpillars were purchased from Monarch Watch. These caterpillars are in their first of five instars. For each instar, the caterpillar molts, and usually eats the molted layer. Caterpillars, as in all insects, have their skeletons on the outside. These caterpillars will each eat about eighteen inches of milkweed over two weeks and then will metamorphose into a chrysalis. After about ten days a monarch butterfly will emerge and within a day be ready to fly. What you plant makes a big difference. Revel in a flower’s color and shape or in the twitter and flight of birds. at beauty of sight and sound in our gardens depends on something very small. Insects. Bugs that move pollen from plant to plant. The common milkweed boasts the largest leaves, but other species may be more welcome in your garden. The common milkweed, Asclepias syriaca, grows into a gangly, five foot stalk. The more compact swamp milkweed, Asclepias incarnate, tops out at 2-4 feet and displays crowns of rosy purple flowers. 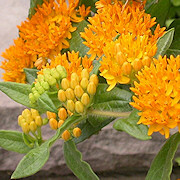 The commonly-known butterfly weed, Asclepias tuberosa, is even smaller at the mature height of 1-3 feet. Thomas Jefferson favored this species, which sports orange or yellow flowers, for Monticello’s garden. All these native species support monarch butterflies, but the larger plants display more surface area for the caterpillars. One of those insects is in trouble. The population of the monarch butterfly, an insect that is itself a work of art, is in steep decline because there aren’t enough of the right plants growing in the right places. 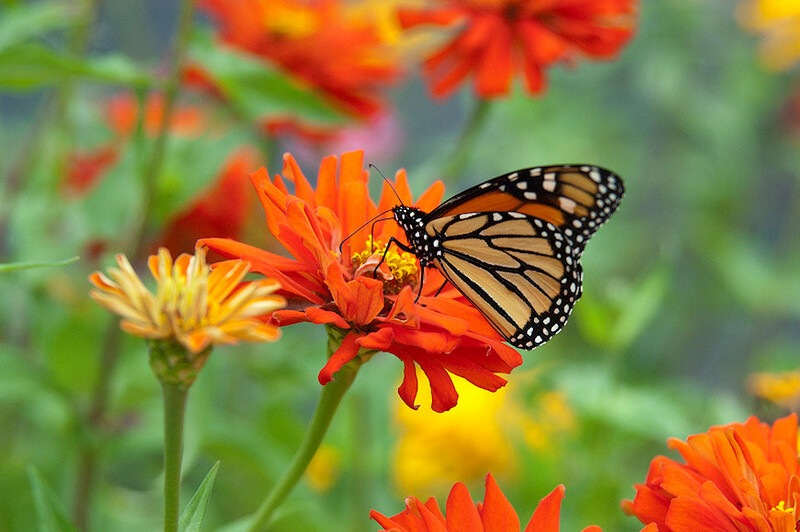 Many butterflies can sip nectar from a variety of flowers, and their caterpillars happily munch different plants; not so with the monarch butterfly. This iconic black and orange beauty is monophagus — as a caterpillar, the larvae can eat only milkweed. That means the female monarch has to find milkweed leaves on which to deposit her eggs. No milkweed, no monarchs. And it takes a village full of milkweed. A monarch can lay about 700 eggs over a few weeks, but each caterpillar needs more than six inches of plant to develop properly. That’s 350 feet of plant growth needed for a single butterfly’s egg-laying efforts. That much milkweed isn’t out there anymore. Unfortunately, many gardeners consider milkweeds mere “weeds” unfit for a proper garden. Directions: Place your seeds in moist paper towels and refrigerate for four weeks. Check the bag regularly for signs of sprouting. Plant the newly-spouted seeds under ¼-inch of soil in full sun and water regularly. The milkweed should mature to its full size within a few years. It is well-behaved since it does not spread as dramatically as common milkweed. There are 110 species of milkweed native to North America, however relatively few are native to Fairfax County. The name implies milk, but it actually derives from the leaves’ latex sap, which is distasteful to other animals because it contains toxic cardiac glycosides, compounds that can interfere with the workings of the heart. Monarchs store this compound in their wings and exoskeletons, which makes the insect noxious to predators. Once established, milkweed can spread through its roots as well as seeds while sporting surprisingly beautiful flowers of orange, purple, pink or white that attract many other pollinators. If you plant milkweed or butterfly weed, native pollinators will join the monarch butterflies in thanking you for protecting the monarch migration phenomenon across the eastern United States. 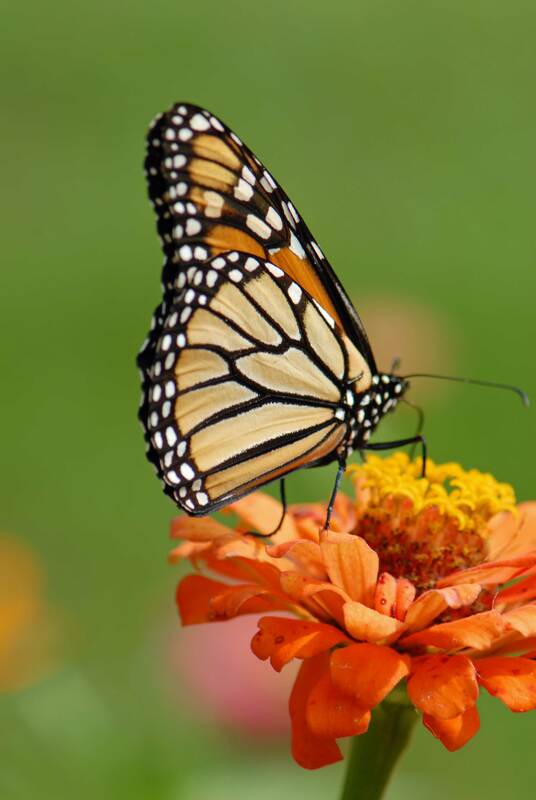 There’s more information on monarch butterflies on the Park Authority website. Author Suzanne Holland is the Visitor Services Manager at Hidden Oaks Nature Center in Annandale, Va. This entry was posted in Uncategorized on June 8, 2015 by Fairfax County Park Authority. Thank you for taking care of the monarchs! I miss them. I will ask my son, who lives in Fairfax, to bring me some as well. I will plant them when they are ready in my garden.